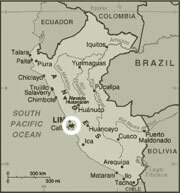 Peru is divided in two by the Andes Cordillera, with an arid fringe to the west of almost 2,000 km, on the shores of the Pacific Ocean. To the east of this are the Andes, and beyond, the Amazon Jungle. In the 1940s, 60 per cent of the population of the country lived in the rural Andean regions. Now 73 per cent of the population lives in the cities, the majority of them on the coast. Even so, not only the country's climate, but its geographic potential as well, are determined by the Andes. To travel from the coast to the jungle it is necessary to cross the Andes, always on difficult roads. Communications between north and south are always made along the coast. There are no adequate roadways travelling the length of the country either in the mountains or in the jungle, where rivers are the main form of communication. The products of the agriculturally rich high forest rarely reach the markets, as they have to cross the Andes to get there, or they must travel to the Atlantic Coast after a long journey on the Amazon. The production of minerals in the mountains goes directly to the coastal ports. The coastal agro-industry was and is oriented towards export, but it can barely compete with countries closer to the northern markets. At the beginning of the 21st century, the enormous city of Lima1 had reached the end of the process of demographic transition. It is generally held that the city's growth rate today is below 2 per cent per annum, a tremendous difference from the vertiginous growth of the 50s and 60s. The 1993 census also notes that natural population growth is responsible for 70 per cent of the total, and that immigration has reduced from 70 to 30 per cent in the last 30 years. Despite its huge size, the city is no longer growing in the explosive fashion that characterised it in the 50s and 60s.